This photo, taken by a DigitalGlobe Earth-observing satellite, shows the cruise ship Costa Concordia as it appeared from space on Jan. 17, 2012. The luxury cruise ship ran aground in the Tuscan waters off of Giglio, Italy on Friday, January 13, 2012. An Earth-watching satellite has snapped a stark view of the Costa Concordia shipwreck from space, showing the huge ocean liner on its side just days after it tragically ran aground off Italy's Tuscany coast. The new satellite photo was taken Tuesday (Jan. 17) by an Earth-observation satellite operated by DigitalGlobe, a Colorado-based company that uses a constellation of spacecraft to take high-resolution images of Earth. 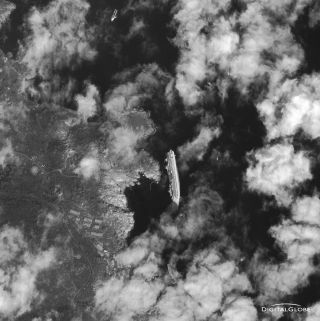 In the satellite view of the Costa Concordia shipwreck, the luxury cruise ship is visible through a scattered cloud layer, as it lies half-submerged off the coast of Giglio, Italy. The ocean liner hit a reef on Jan. 13 and tipped over. The Costa Concordia was carrying about 3,200 passengers and a crew of 1,000 when it ran aground, according to news reports. The accident killed 11 people, with more than two dozen others still missing, the ABC News reported today (Jan. 18). Rescue efforts were suspended today due to rough seas that apparently shifted the huge ship. A closeup image of the Costa Concordia cruise ship taken by a DigitalGlobe satellite on Jan. 17, 2012. The luxury cruise ship ran aground in the Tuscan waters off of Giglio, Italy on Friday, January 13, 2012. DigitalGlobe operates a constellation of three satellites — the Quickbird, Worldview-1 and Worldview-2 spacecraft, each equipped with cameras to provide high-resolution imagery of Earth for commercial uses. The company also uses aircraft to collect Earth images from lower altitudes. This is not the first time satellites have snapped images of Earth to chronicle major news events. A swarm of Earth-monitoring satellites regularly snap images of the Earth for commercial customers and military uses. They have been used to track natural disasters, such as the devastation from the March 2011 Japan earthquake and tsunami, as well as aid recovery efforts. In January of 2011, a DigitalGlobe satellite snapped a view of the compound of Osama bin Laden in Abbottabad, Pakistan, which U.S. soldiers later raided in a May 1 attack that killed the terrorist leader.